I strongly believe that Gibraltar’s specific needs must be carefully considered in the ongoing discussions about the UK’s departure from the EU and the subsequent negotiations over our future relationship. Gibraltar has unique issues which must be taken into account as we move forward in these difficult discussions. I have previously called for a specific representative within the Department for Exiting the EU to help ensure that Gibraltar’s interests are not forgotten. The local economy is very much reliant on the free movement of people. A hard border between Gibraltar and Spain could put at risk more than 10,000 jobs belonging to those who cross the frontier daily. This would negatively affect both the local economy and the wider, regional economy, for which Gibraltar is the second largest employer in Andalucía. Gibraltar and the surrounding Spanish economy are mutually beneficial, indeed inextricably linked. A sensible, pragmatic solution must be found. Securing maximum freedom for Gibraltar to participate in the single market is essential. Given Gibraltar’s largely service-dominated economy, any barriers to trade with the EU’s trading bloc could be disastrous. The people of Gibraltar are enthusiastic Europeans, voting overwhelmingly to remain in the EU and we must work hard to ensure their interests are right protected. The people of Gibraltar are determined to fight any attempts by Spain to revive sovereignty discussions. Their right to self-determination is unequivocal, contrary to recent comments made by the Spanish government. Gibraltar benefits significantly from EU funding, receiving tens of millions of pounds over the last 16 years. This is obviously a significant amount, given the size of the territory. It is unclear how far the UK Government would replace any of this funding stream but there should be a commitment that there will be no reductions over the long term. Appointing someone from within the UK Government in London who understands the issues most important to Gibraltar would be a strong signal in protecting Gibraltar’s best interests. 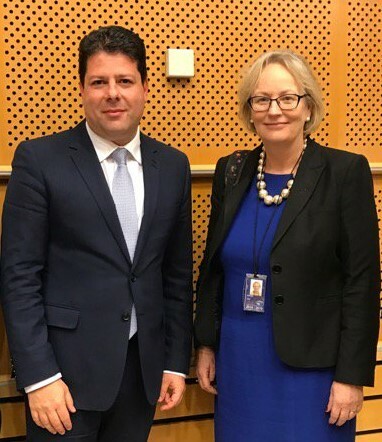 I have been very proud to be Gibraltar’s MEP since my election in 2009 and I will continue to represent their interests, both domestically and in Brussels, as we move forward in the Brexit negotiations. Gibraltar’s representatives should continue to be included and consulted at every stage of the UK’s negotiations with the EU where decisions may affect them, to guarantee the territory’s interests and to ensure that its status in the EU can be as protected as possible.